Direct government spending only accounted for 14% of Ukraine's GDP. 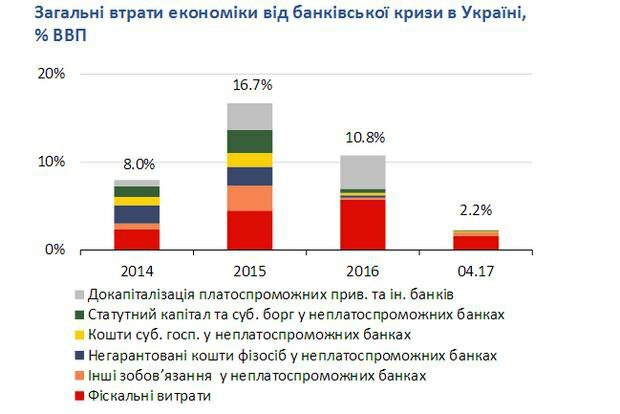 The National Bank of Ukraine estimates the cost of the banking crisis of 2014-2017 at 38% of the nation's GDP, including 14% in direct fiscal loss of the state (the nationalization of PrivatBank, recapitalization of state-owned banks, the payments of the Deposit Guarantee Fund, etc.). The third financial stability report that the central bank released on Tuesday said that the government spending on overcoming the consequences of the banking crisis exceeded the spending during the 2008-2009 crisis. "Direct government spending was only a part of the public losses resulting from the banking crisis. Among other components were the liabilities of insolvent banks both before corporate sector and individual clients, whose deposits were in excess of the size insured by the state," the report said. "Those payments were the responsibility of the Deposit Insurance Fund and amounted to 16% of the respective years' GDP. The operating costs that owners of banks spent on additional capitalization and losses sustained by the owners of insolvent banks were all part of the public losses," the report reminds. "All thigs considered, the economic losses from the banking crisis, run into 38% of GDP," the NBU concluded.